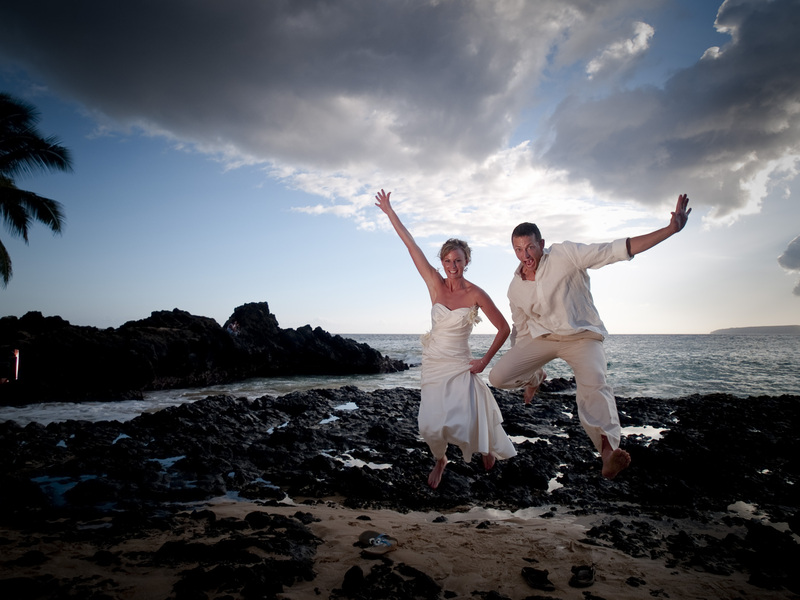 I took pictures for my friends’ (aka, former roommates, Mike & Megan) wedding in Maui. Gear: Olympus E620, E1, ZD 12-60mm F/2.8-4.5, &50mm F2.0, Cactus V4 Flash Triggers, FL50R, FL50, 1/4 CTO Flash Gels, Lumiquest Gel Holder, and Honl speed strap. Pics turned out really good. I was pretty pleased with the results. 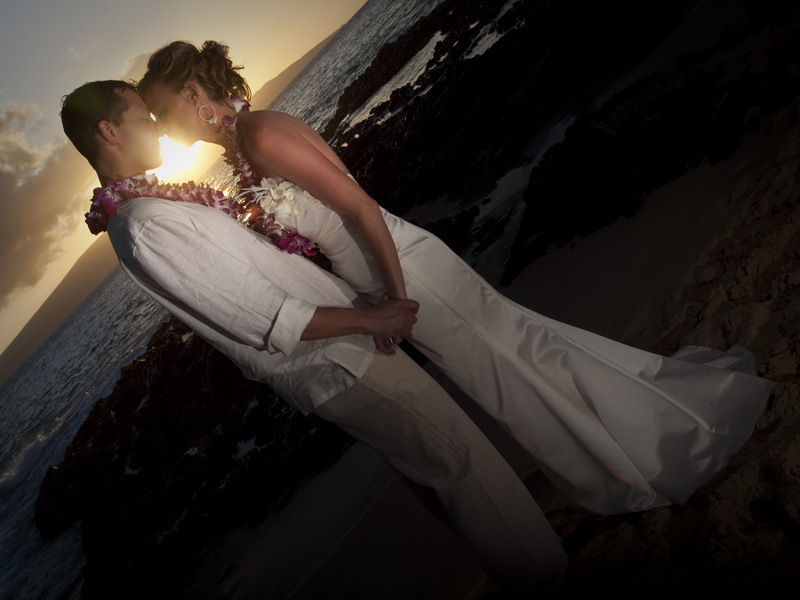 It was my first time using the flash gels which I had bought to use with the wedding in mind. I used them to help match the flash with the fading light from the sunset, with the added bonus that shifting the white balance a bit would put a little more blue in the sky. I started off with using only 1 flash, but later used two flashes triggered with the cactus v4 triggers, set at either 1/2 power or 1/4 power. Key light was set directly opposite of the setting sun, and i took most of the shots about 30-45 degrees off that axis (with the 2nd flash, i would set it around 90 degrees off of the axis, with me between the flashes). I didn’t bring any stands or other light modifiers, just the gels, so i had some friends assist by holding the flash (they held it around chest level). Shots were mainly taken around f/5 – f/5.6 shutter speed 1/160 s- 1/320 s.
Anyway, I’m always learning with this photography thing. Sync Speed: I made some beginning strobist mistakes (I’m such a n00b)… I tried pushing the flash up past it’s sync speed (my camera’s sync speed is 1/160th of a second). I thought it was working, til i looked at the pics on my computer monitor when I got home, and then it hit me. I thought my flashes weren’t directed properly in some frames because it wasn’t getting the flash coverage. I noticed it was always on the bottom of the frame (the mirror was cutting it off). I was shooting 1/160th & 1/200th of a second okay, but the 1/250th and 1/320th all had the distinct underexposed areas in the frame. (The reason I had the shutter so fast was to help darken the ambient light so i wouldn’t have any blown out highlights. When trying to control light, the aperture controls the flash exposure, and shutter speed controls the ambient.) In any case, the wide shots were okay cuz could crop it, but definitely something I’ll wanna keep in mind for the next time. In hindsight, I should have used the neutral density filter or the polarizing filter i brought along to bring down the ambient. Light Stands & Umbrellas: Another thing I would change is if I could have brought my light stands & umbrellas, that would have been nice to get the light above, and the umbrellas would have given a larger softer light source. Would have created nicer catchlights in the eyes, and a little more even lighting. Lighting from above would have given more natural shadows. Light angles: I probably should have done a little more on axis fill flash. I botched some pretty straight forward group photos cuz I was trying to stick with off camera flash, but better results would have been had with on axis (even on camera) fill. But a lot of that had to do with not getting the light to come down from above, so it was some unanticipated and unnatural shadows being cast. I also could have done a little more with rim lighting/hair light/back lighting. Something for next time I suppose. I mean, if I learned it all at once, there’d be no use for me to write this blog! Gels: Something for next time: experiment with mixing gels, balancing/cancelling light, and setting a custom white balance in camera so I can get more accurate results when checking them out on location. Other things to work on: I need to take photos from more angles, and use longer focal lengths to compress the angle of view. I figured I’d keep it pretty wide to really capture the scenery, but variety is the spice of life. I need to mix it up and think outside of the box sometimes. Anyway, I think that’s all for now. If I think of something later, i’ll add it. Comments/Critiques welcome. My monitor isn’t calibrated (yet, hoping to get a calibrator over xmas), so there may be some general color issues. Plus, I’m using a cheap TN monitor, word is the IPS monitors are where it’s at. I’ll probably look into that at a later time. Also, the compression seems to do some strange things to the photos, even color wise. I’ll have to figure out something with that.